The PJSE Lviv Coal Company is owned by some three private firms and the state (which owns 37,6% of the statutory capital). There are about 900 workers at the enterprise and 50% of them are women. The situation in the company is very complicated and there are chronic and long delays in the payment of wages. Not long ago the workers of the PJSE Lviv Coal Company were assured by officials and, in particular, the Deputy Minister of Energy and Mines Igor Martynenkov, that they would received at least a part of wages until 9th May. But all these promises haven’t been fulfilled and now the arrears of wages are about 11.6 million UAH. 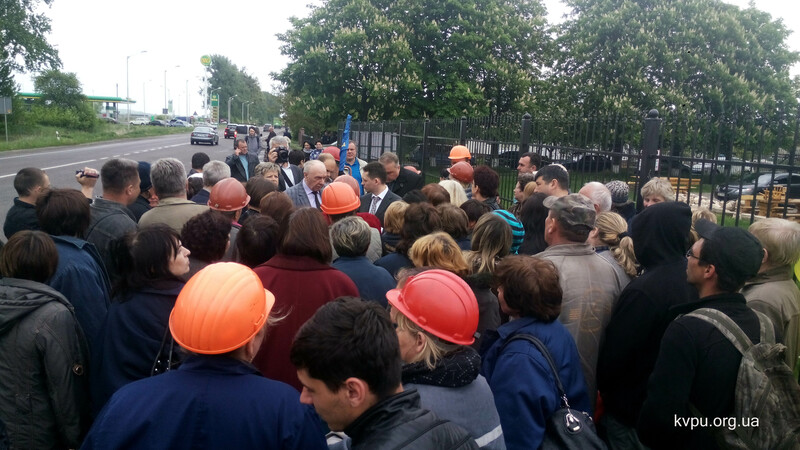 As it was announced, today at 11.00 a.m. workers and trade unionists of the PJSE Lviv Coal Company started their protest and blocked the international road highway Lviv-Rava-Ruska. After that the representatives of the Lviv regional state administrations and the Sokal state administrations, local offices of the Interior Ministry, the Security Service and the State Property Fund, the Prosecutor’s Office and others immediately appeared in front of the protesters. The officials started to persuade workers and trade unionists not to interfere with traffic. The protesters were promised again, that the urgent problems of their company will be resolved soon and they will receive their money. Also the representative of the Security Service reported that they were able to identify the real owners of company and it’ll make things better. The head of the NPGU primary trade union of Lviv Coal Company Olga Shkoropad said that messages from authorities has given her some hope. She also informed, that workers decided to suspend the protest and try to resolve problems during the negotiations. Tomorrow there will be a meeting in Kyiv with the First Deputy Minister Igor Martynenkov, representatives of the PJSC Lviv Coal Company, officials of the Lviv regional state administrations and the State Enterprise Lvivvugillya. Olga Shkoropad will represent workers of the company. But she and her colleagues aren’t very hopeful for the success of this meeting. Workers and trade unionists are thinking about their future actions.